SharePoint apps give a possibility to have an e-mail message sent automatically when something in a list or library has been changed. This is a very useful feature when several people are working with the items in an app, which is most often the case in SharePoint. In the demo below Peter Kalmström, CEO and Systems Designer of kalmstrom.com Business Solutions, shows how to set alerts in a SharePoint list with the modern interface, but the process is the same for libraries and calendars and for the classic interface too. Open the list where you want to set an alert. Click on the Alert me button under the ellipsis in the command bar (modern) or under the ITEMS or LIST tab in the ribbon (classic). Change the title if you don't want to use the default, "list + item". If you are a site collection administrator, you can add other persons who should have this alert. If you have text messaging service set up, you can choose between having the alert by sms or by e-mail. Otherwise e-mail is the only option. Select what changes you want to receive alerts for. Select when you want to receive alerts. You will now receive an e-mail that your alert has been set up. If you only want to set the alert for changes in one item, open the list and select the list item you want to set an alert on. Then follow step 2-8 above. You can repeat this for several items if needed. Also refer to next article about two additional alerts in tasks and issue tracking lists. 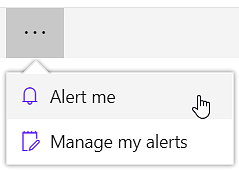 When you want to have the change alerts in a certain Outlook folder, you can create an Outlook rule that automatically moves the alert e-mails to your specified folder. In the demo below Peter shows how to do that. To have customized notifications you need to create a flow or workflow. These give nearly endless possibilities for under what conditions the e-mail should be sent, what the e-mails should contain and who should receive them. Refer to our Tips series on workflows.